Easy to use, comfortable and sturdy, the Wunda Chair System from Balanced body is also expandable with optional handles and a high back. Based on Joseph Pilates’ original design and dimensions, our Wunda Chair is classic in design and size while offering the widest range of resistance for any single-pedal chair. You can start with a basic Wunda Chair, then add optional handles and a high back later as your program progresses. Or add optional cushions and your Wunda Chair flips to become a small-scale chair as originally designed by Joseph Pilates to fit into small living spaces! 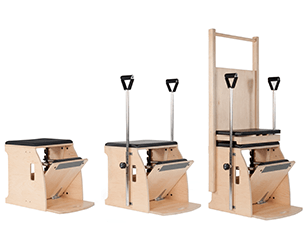 Widest range of resistance for any single–pedal chair, up to 83 lbs. Two springs (black/heavy) are adjustable to 8 resistances and provide 28% more usable resistance than other chairs. 2 springs (2 black); 4 resistance positions for each spring. Cut-out handles for secure handhold. Heavy-duty vinyl in 35 colors. Of that total, 9 are standard/free, and an additional 26 custom colors are available (additional charges apply). Try our Color Tool and get more information here, or email us for a sample color palette. Included with all new Chairs, may also be purchased separately. Turn your Wunda Chair becomes a stylish piece of furniture.